I'm publishing a lot more video on LinkedIn these days. I believe it helps our connections get to know us better. They get to see our eyes, our smile, and some of our personality. More importantly, it builds our authority in our area of expertise. But you may not be familiar with getting video on LinkedIn. Let me share how easily you can include video in your updates and Pulse posts. Click the LinkedIn icon. A new pop-up window appears. Craft your update in the new window. The video will be embedded in your timeline. It'll autoplay but be muted unless the viewer clicks the speaker icon to un-mute it. Stay updated on my future LinkedIn tutorials. I respect your privacy. Of course you can unsubscribe at any time. Now sometimes you'll be on other sites that may not have a LinkedIn share icon. This is what happens on Vimeo for example. Don't worry, it's still easy to share videos from these services. On Vimeo, find the video, and click Share. Return to LinkedIn and craft an update. 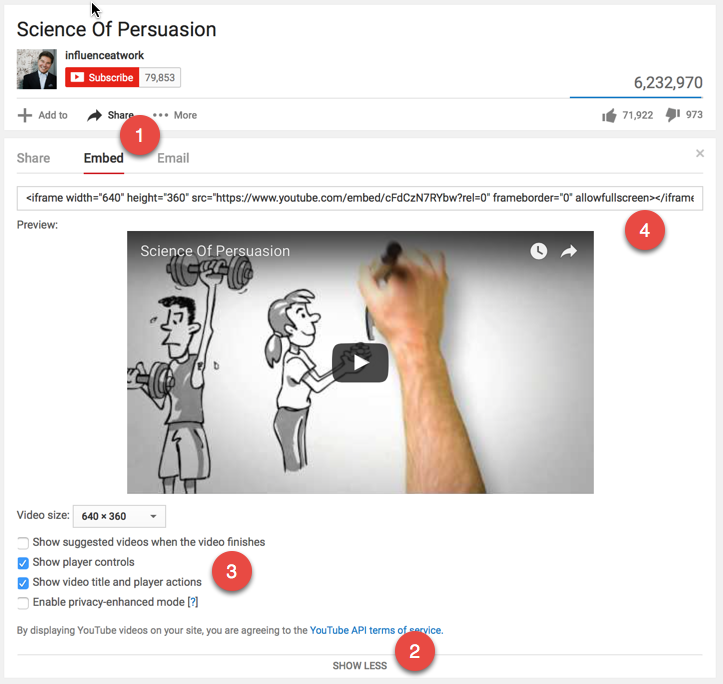 Just like the YouTube embed, the video will appear in your timeline, auto-play, and be muted. It important to note that not all services with short embed code will work. For example, Wistia and GoAnimate can't have their code pasted into LinkedIn and automatically work. For these services, a small thumbnail will appear and your viewers will have to click over to the other service to watch. For me, that's not the ideal user experience. I don't want my users to have to jump to another website to view my shared video. For that reason, I'll either embed something that plays inline or just include and image that links to it. Now if you're writing Pulse articles, and I encourage you to do so, you have the option to embed video 2 ways. Click the Play icon to copy & paste the video short code. Click embed icon to paste the longer form iFrame code. The longer form embed code gives you finer control over your embed options. For example, from YouTube, you can choose NOT to show recommended videos. If you've followed any of my other posts, you know I hate YouTube's recommended videos as your call-to-action. While on the desired video, click Embed. Make sure the first and last options are un-checked. Return to LinkedIn and click the embed code icon. Paste the iFrame code into the dialog box. Now I hope you share more of your own video so your connections get to know, like, and trust you more. But even if you want to share other people's videos, now you know, it's really pretty easy.